In need of a lovely little gift for those you love on the 14th? Something small that says ‘I’m thinking of you’? Heartfelt rings are a perfect fit. A little knitting, a little soap and hot water, that’s it that’s all! 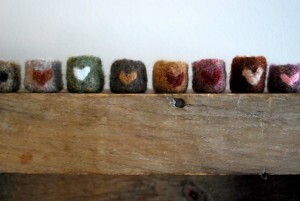 Heartfelt Rings are a free pattern from Tiny Owl Knits, one of our faves. We are all currently knitting away for the Tiny Owl Knits KAL and some Heartfelt Rings would be a lovely addition. The yarn is a sock weight (about 28 stitches per 4 inches), but make sure you are NOT using a superwash yarn, it won’t felt! This entry was posted on Wednesday, February 8th, 2012 at 10:34 pm	and is filed under Uncategorized. You can follow any responses to this entry through the RSS 2.0 feed. Both comments and pings are currently closed.